The Race Pack for the Carmarthenshire Duathlon 2014 is now available for you to download – please make every effort to read this very carefully so that you can enjoy your day’s racing. It has been updated as the First and Second Runs will now follow the same course. 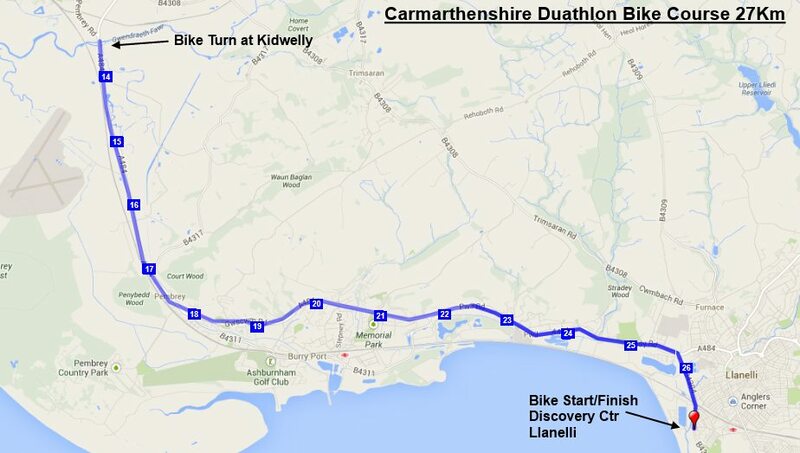 We have a fantastic course for the return of the Carmarthenshire Duathlon which will start and finish outside the Discovery Center in Llanelli. 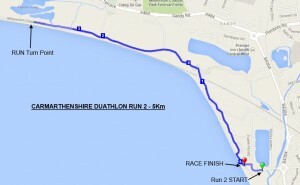 The two runs will be different which is highly unusual for a Duathlon with the 1st run taking you down towards Machynys Golf Course along the Millennium Coastal Path whilst the second run will take you down towards the fishing lakes in Pwll. 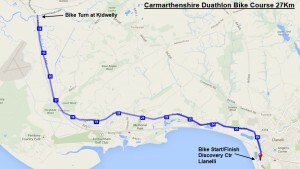 The bike ride will take you down towards the historic town of Kidwelly. This is very fast Duathlon course with less than 10m climbing on the run and a maximum 50m climb on the bike — the wind however may have something to say on the day!! It is very important that all race entrants carefully read the Race Details. There will be a mandotory race briefing at 8:45am outside the Discovery Centre in the North Dock. 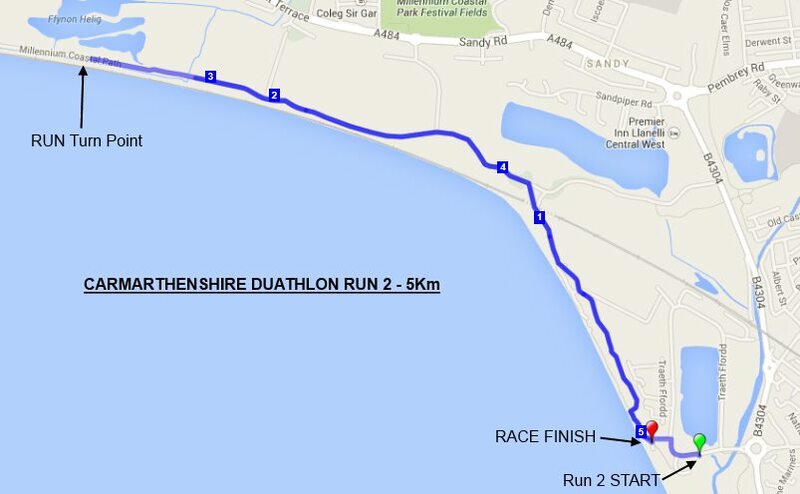 The Carmarthenshire Duathlon will start and finish from the Discovery Center of the Millennium Coastal Park in Llanelli. The postcode for you to use is SA15 2LF. The venue is well known to those who have competed in our Llanelli Triathlon’s over the years. There is parking for 150 cars at the Discovery Center car park and you will have to pay for the Car Parking here at the Pay&Display kiosks. There are 100 free spaces available at the Dragon24 offices which are on your right as you come into the North Dock. If these car parks are full, marshals will direct you to appropriate alternative parking. Do not park on the road along the sea front or on residential roads. Registration will take place at the Discovery Centre at the Millennium Coastal Park’s North Dock on Sunday Race Morning between 7:15am – 8:30am . At registration you will be given your race numbers, a sticker for the bike and timing chip. British Triathlon members must produce their race licence at registration, or purchase a day licence at £5.00. If you are not a member then you will have to purchase a day licence. No licence = no race. No exceptions. Your race numbers will be given to you at registration. Numbers must be worn on the REAR during the cycle stage, and on the FRONT during the run. They must not be folded. Race belts are allowed provided the number is visible to the front or rear as above, and is not folded. You will also have a sticker with your race number on. Please place this on your bike. Please make sure you complete the medical information on the back of the race numbers. Timing will be with chip timing. Please ensure this is safely strapped on. If you don’t wear your timing chip there will be no Race Time for you. You must return your chip at the end and make sure it is safely place in the collection bucket. Failure to return the chip will results in you paying £30 for the chip to be replaced by the company. The transition area will only be open during the times listed above. There will be NO access to the transition area outside of these times, or before the last cyclist has returned. No-one other than athletes, bearing a race number, will be allowed into the transition area – no exceptions. Bikes must be hooked onto the racking by the saddle. Your bike must have the bike sticker clearly visible. Your race number must match your bike number in order for you to retrieve it. Water and bananas will be available at the finish. You will also receive your Finish Memento here. If the weather is very poor then your Race Momento can be collected from inside the Discovery Centre. Please collect your bike and kit from transition as soon as you can after transition has re-opened (as soon as the last runner is out on the course). You will need to show your race number to gain access to transition and remove your equipment, and this must match the one on your bike, so please don’t lose it. Public toilets are available in the Discovery Centre and there will be portaloos available in the Race Car Park. Showers – Hot showering facilities will be available at Llanelli Leisure Centre which is less than one mile away. The presentation will take in the Discovery Centre,as soon as possible after the last finisher. Prize categories as per Entry Form. Drafting is always a problem with Duathlon & Ttriathlons especially when the entry field is quite large. We will have motorcycle referees and they will take the race numbers of any cyclist drafting. At the race briefing all athletes will receive their first formal notice, anyone caught drafting on the bike course will then be immediately disqualified. To minimise the number of bikes leaving transition together we may well have 3 or even 4 waves. These waves will have on average 50 athletes and there will be 10 minutes between waves. This is an option we are considering in an attempt ot reduce the risk of drafting taking place. Many thanks to yourselves as athletes for supporting the Llanelli Waterside Sprint Triathlon.